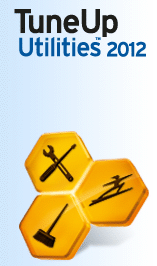 PROS: Tuneup Utilities 2012 is built upon years of tweaking and re-tweaking to get the most out Windows with all types of hardware. The Program Deactivator removes overhead from your system by temporarily disabling applications (and their associated processes and services) while you enjoy the benefit of more system resources–for your important tasks. Economy Mode saves battery while you’re on the go. VERDICT: If TuneUp released a product for cars, mechanics would go out of business. 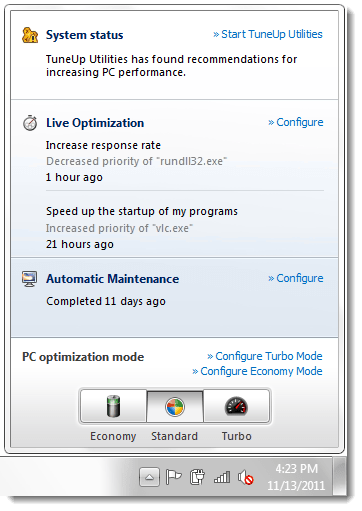 TuneUp Utilities makes PC maintenance easy–very easy. 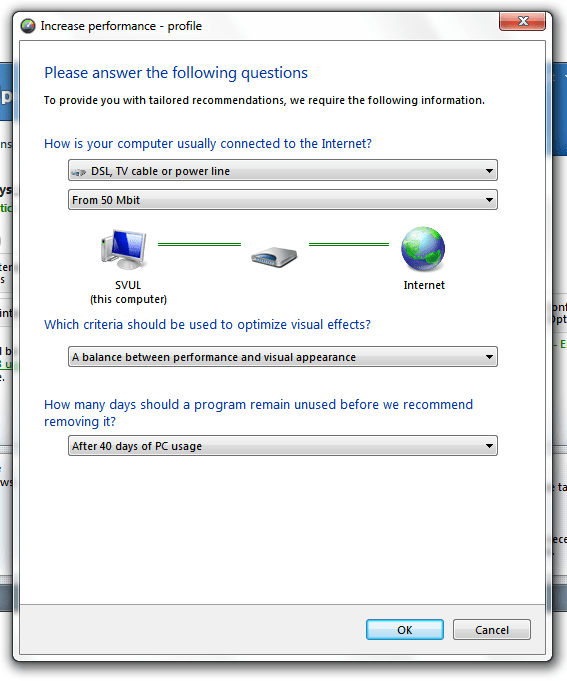 I recommend this program for users who are not comfortable tweaking and maintaining their PC and would like an easy way to keep things in check and have a PC that runs without unnecessary interruption. TuneUp Utilities is a long-standing member of the PC tweaking programs club and they’ve continued to improve their product, at a steady pace, year after year. For 2012, they’ve introduced Economy Mode, which helps save battery life—keeping you connected for longer while you’re mobile. This is the only new major feature this year; however, the program has been updated with more tips and tricks, revisions to previous tweaks, and UI improvements to help you work your way around this powerful collection of tools. 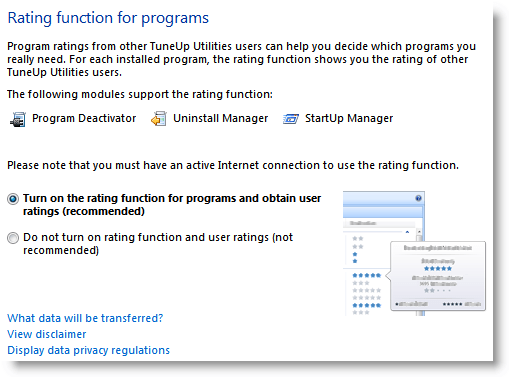 If you’re new to TuneUp Utilities, you might enjoy this little overview; otherwise, skip to what’s new. 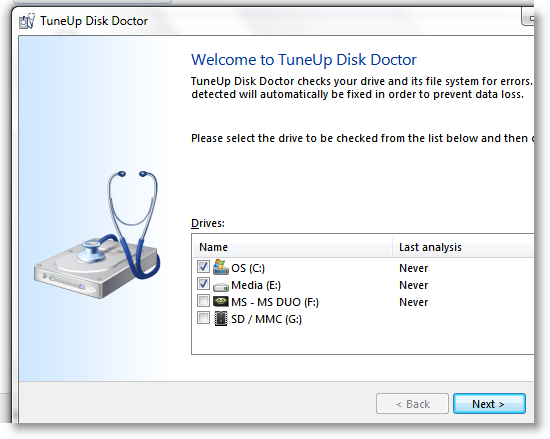 TuneUp scans your PC’s settings, system files, registry, and more and, based upon what it finds, offers you tips to improve your PC’s performance. 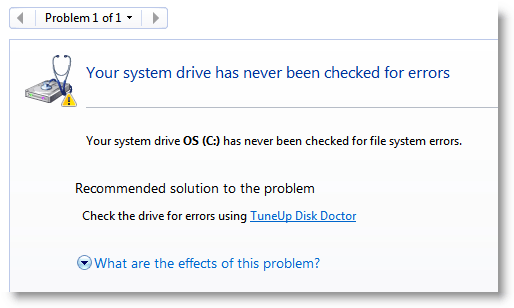 TuneUp can take care of everything for you with one click or can walk you through the process of speeding up your PC. You can manage TuneUp right from the system tray and get a quick overview of any potential problems that exist. You can also switch between Turbo, Standard, and Economy Modes. 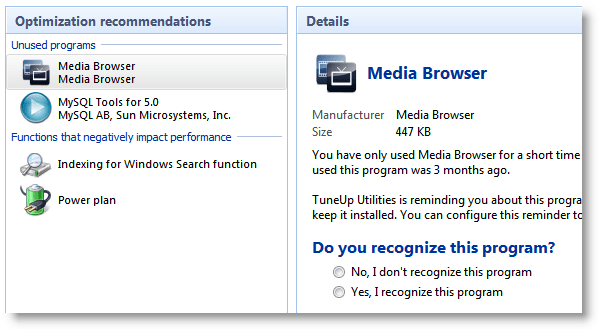 Note: Some of the following screenshots come from the TuneUp Utilities 2011 review–the features in 2012 are the same. As with all good optimization programs, you can back out your changes at any time. The TuneUp Rescue Center can help you fix and problems that may be caused by over-zealous clean up. The Program Decactivator deactivates programs that you currently don’t use. By deactiviating a program, you stop the services and supporting programs that are run by it. If you need some of these programs occasionally, it could be tedious to uninstall and reinstall these programs again and again. The Program Deactivator is designed to “pause” a program until you need it again. I deactivated iTunes (which tends to slow down my PC), plugged in my iPhone, and TuneUp popped up to let me know iTunes had, in an instant, been reactivated for use again — easy! I also spoke to one of the founders of the company, Tibor Schiemann, and he verified that no personal or identifiable information is sent in this process and that your anonymity is high priority. 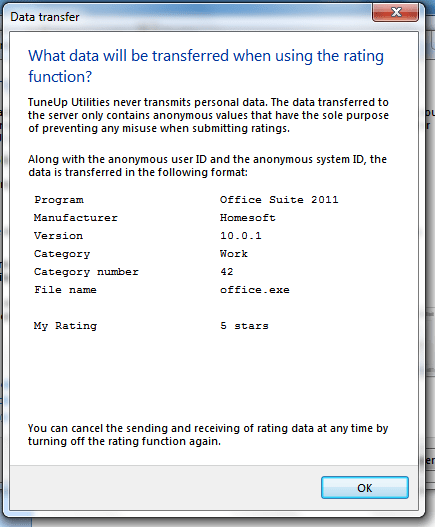 One feature that isn’t new but is very useful is TuneUp Shredder. Find out how to use it here: Permanently delete files with TuneUp Shredder. That concludes the overview. Now, on to the new features in 2012. TuneUp Economy mode changes system settings, disables hardware, and helps your PC run more conservatively to help save battery life. If you’re someone who is on the go all the time, you know how much an extra 20 minutes of battery life can help when you’re, for example: stuck on a plane; finishing a report just before class; or cramming a revision session in outside the exam hall. Economy Mode can be accessed with just two clicks (click TuneUp in the system tray and click Economy Mode) and it will instantly start saving you power. Setup: New installation Windows 7 Ultimate w/SP1 and VLC Player. Battery fully charged. The results of this test are fairly significant; use of Economy Mode is a far better option than Windows “Power saver” mode or no power savings. As you can, see there is more information on what steps you’ve taken to optimize and what is outstanding–unused potential. As each utility within TuneUp has it’s own configuration, you can quickly get lost in settings screens and even change the same settings twice or three times through different panels without realizing. This year, TuneUp Utilities comes with a unified settings console to help you configure each tool in a central location. While this isn’t really an exciting feature, it really does help you organize yourself a little more and take a more systematic approach to your optimizing. Enhancements to the program deactivator; now the assistant reactivates programs for use and then automatically deactivates them again for you. Read more about the Program Deactivator in the overview above. hmm Thanks currently using this !